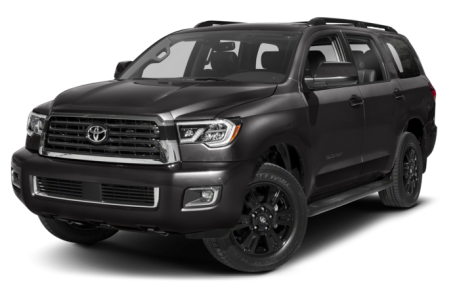 The 2018 Toyota Sequoia is a full-size SUV that seats up to eight passengers across three rows. Powering the Sequoia is a 381-hp, 5.7-liter V-8 engine mated to a 6-speed automatic transmission. It is available in both rear-wheel drive (RWD) and 4-wheel drive (4WD) and offers an available Multi-Mode 4WD dial that allows the driver to switch between RWD and 4WD modes. It competes with the Ford Expedition, Chevrolet Tahoe, and Nissan Armada.